Just thought I would bring you a blast from the past today as we gear up for Easter weekend. Tuesday night we celebrated Passover for the first time (KONOS Style). It was fun. We added a Christian twist to the fourth cup at the end of the story. Then we read a book about the Catholic Sacraments that sparked interesting discussion about the differences in Catholics and evangelical Christians. I just love studying theology and religion. Maybe that is one of the reasons we enjoyed learning about the Native Americans so much. We studied for months about their beliefs and way of life. My kids never got tired of reading about them this time around. Maybe when I get around to sharing 2006-7’s records, I’ll include photos of this week’s “First” Passover. It was dark inside, so my photos aren’t all that great. I DID manage to get some shots of my dressed up (sleeved) Easter Eggs from last night, however. We made the mistake of dying the eggs first. Next time I’ll do it AFTER we sleeve them. 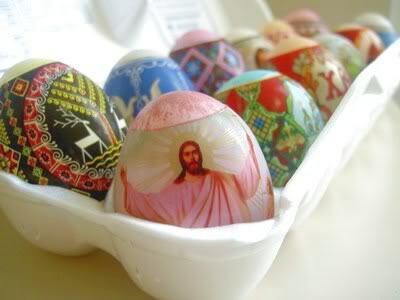 To fit the sleeves, you have to boil them for a couple of seconds and that removes your dye if you color the eggs first. 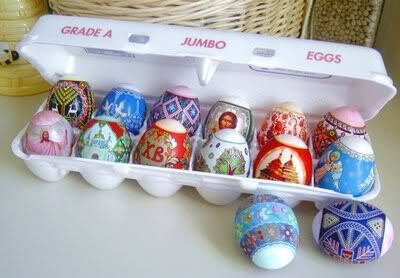 I think the GORGEOUS PYSANKA Easter Egg Sleeves turned out great. They are the finest looking sleeves I’ve ever seen… and even my husband was ‘wowwed’ by them. If you are interested in getting some (even if it is to stock up for next year – like we do), you can check out my buddy Alex’s website. He has Ukrasa brand sleeves that are out of this world. My personal favorites are the …. well, it is too hard to narrow it down, actually. They are all beautiful. By the way, I have a ton more designs that we didn’t use. I could have boiled over 50 eggs last night and never run out of sleeves. This was only one or two out of every design package! Maybe we will bake some Easter cookies today while we do school at home. I hope you are enjoying your week. Remember that you only have until tomorrow at midnight to nominate your favorite homeschool bloggers. I had better go get my kitchen cleaned up after dying all the eggs (before the apartment counter tops are ruined forever). I’m typing this with green and purple finger tips! Wow. i’ve never seen anything like that before! I think that it would be nice if these awards would mention homeschool bloggers who have passed away. I would particularly like to see someone make mention of Lorrie Gnos. Did you know you’ve been listed on the Top 100 Mom Blogs list?? 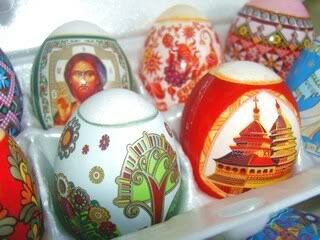 Those are the most beautiful easter eggs I have ever seen! Thanks for all your work with the HS Blog Awards. I’ll be posting about it on Monday. The Bluest Butterfly, I couldn’t agree with you more. I’ll post something today on the HSBAwards site about honoring the homeschool blogging moms who have gone on before us… and remembering their families in prayer. Yes, Pass-the-Torch… I got an email from them. I thought that was nice of them. 🙂 I put their little icon in my sidebar.